In ages past, infections, starvation, and trauma were the major causes of ill health and death. Today it is chronic, degenerative disease, many of which were rare or unheard of among our ancestors. The first heart attack death was reported in the 1870s and remained a very rare occurrence until the 1920s. By 1950 it had become the most common cause of death and remains our number one killer today. Obesity in the US has tripled over the past 50 years, diabetes has increased by 700 percent. Alzheimer’s disease wasn’t even recognized until 1906. The incidence of cancer, arthritis, glaucoma, asthma, and other chronic diseases have skyrocketed over the past 100 years. These diseases were rare among our primitive ancestors and are still generally unseen among modern primitive societies. These once uncommon chronic diseases are often referred to as diseases of modern civilization. Doctors often blame our increased lifespan for these diseases, saying modern medicine and improved nutrition has allowed people to live longer so that we are now developing degenerative diseases more frequently than was seen in the past. However, chronic disease doesn’t just affect the elderly, in fact, chronic disease is occurring at younger and younger ages. It is not unusual for cancer, arthritis, and other degenerative diseases to strike people in their 30s or younger. Degenerative disease is not confined to the elderly. Also, even a century or two ago people lived into their 90s. Most of these people continued to work in the fields and remained physically active and relatively healthy until they died—a far cry from today when people are confined to rest homes and care facilities where they can have constant medical care and supervision for the last several years of their lives. To many, it appears obvious that the dramatic change in diet and lifestyle over the past century is the underlying cause of our declining in health. Modern food processing began around the turn of the 20th century. Before that time foods came primarily from local farms and were sold as is, with little or no processing. Bread was made from whole grains, butter and lard were the most commonly used fats, vegetables oils weren’t used much until the invention of the hydraulic press, the process of hydrogenating vegetable oils for the manufacture of shortening and margarine first appeared in 1912. Sugar consumption has risen from about 15 pounds per person annually in 1800 to about 140 pounds today. This level of sugar consumption is actually down from what it was a decade or so ago because the use of artificial sweeteners has steadily increased. In the late 1890s a man by the name of Weston A. Price graduated from dental school and began his dental career. He was a brilliant scientist and served for many years as the director of research for what is now known as the American Dental Association. In his clinical practice he was astonished by the gradual increase in dental diseases that he observed over his career. He was seeing more and more dental diseases late in his career that he had rarely seen when he began dentistry. He wondered if the change in the diet that was occurring at the time was the reason. He decided to find out and in 1930 began a decade long study to see how different diets affect both dental and overall health. He traveled throughout the world studying how various diets affected people’s health. He went to remote areas where people were still eating their traditional or ancestral diets and examined their teeth and overall health. He would then examine similar groups of people in the same region who had begun to adopt Western foods, primarily sugar, white flour, and processed vegetable oils. He discovered that when people ate their traditional foods they had excellent dental, physical, and mental health. However, as soon as they started adding processed foods to their diet, their health declined sharply and dental disease became rampant. In every population he studied it was the same. It didn’t matter where the people lived or what they ate, as long as they remained on their ancestral diets they were protect from the ravages of modern chronic and degenerative disease. Some populations, like the Alaskan Eskimo, had a diet that consisted almost entirely of meat and fat. Others, like the Pacific Islanders ate mostly vegetables and fruits and still others in isolated villages in the European Alps relied primarily on dairy. Dr. Price found that it was our modern processed foods, principally sugar, that was causing the decline in American’s health. Recognizing diet as a primary cause of chronic disease, many people have adopted a more natural diet. 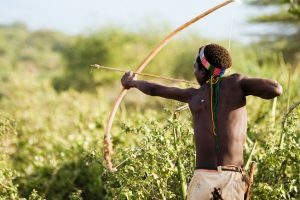 Some people have returned to eating the way people did in the past, consuming only foods that were eaten by our ancestors. Such diets are referred to as ancestral diets. The most popular ancestral diet right now is the Paleo diet. Those following this diet try to eat only foods that were available to our Paleolithic ancestors that lived some 10,000 to 20,000 years ago. The Weston A. Price Foundation, an organization based on the discoveries of Dr. Price, promotes an ancestral diet, but does not go so far back in history. This diet encourages the consumption of organically produced whole, natural foods, much like the foods your great-grandmother would have eaten. A similar diet is the ethnic ancestral diet in which people eat the types of foods their direct ancestors ate. For example, there are native Hawaiians that eat only traditional Hawaiian foods such as poi, taro root, plantains, coconut, breadfruit, fish, and so forth. While there are slight differences in the types of foods eaten between these ancestral diets, the one thing they all have in common is the avoidance of modern processed foods. They tend to avoid foods or food ingredients that would have been unrecognizable to our ancestors such as soda, candy, chips, processed lunch meats, and foods that contain artificial or chemical ingredients like MSG or aspartame. Foods would be organically grown and definitely not contain any genetically modified ingredients. Processed sugars of all types are also avoided. In essence, the foods they do eat are those that would be recognized by our ancestors or at least available to them in their day. It is reasoned that if we can get back to eating more like people had in the past when they consumed only whole, natural foods, and eliminate sugar and other highly processed foods, health would improve. Indeed, this is what happens. This is why ancestral diets have become so popular in recent years. People lose unwanted weight and feel much better. Often, even longstanding health problems such as arthritis or inflammatory bowel disease disappear. However, there are those who do not see the remarkable improvements reported by others. They may lose a little weight, find their arthritis pain a little less painful, or have less digestive troubles, but the problems still persist. They follow the diet as they are instructed, so why aren’t they feeling better than they do? There is one very important element that has been a part of all ancestral diets from the beginning of time that is missing from nearly all of our modern versions of these diets. Adding this missing element can make any ancestral diet ten times more effective in preventing and reversing chronic and degenerative disease. This missing element is periodic fasting. Our ancestors did not have access to the abundance of foods that we enjoy today. They didn’t have the luxury of eating three meals a day. Often, they were lucky to get one meal daily. They had to search and hunt for their food. When the hunt wasn’t successful, they went hungry. Crops often failed or were devastated by droughts, insects, animals, and disease, and they went hungry. Our ancestors missed a lot of meals and went for days, weeks, and sometimes even months with little to eat. Adding periodic or intermittent fasting to an ancestral diet can more accurately mimic the eating patterns of our ancestors and provide the missing element that can stop and even reverse chronic and degenerative disease—the so-called diseases of modern civilization. Fasting has long been used as a form of detoxification and rejuvenation. Fasting therapy rode a wave of popularity during the latter half of the 19th and early part of the 20th centuries. It was used to treat hard to treat conditions such as asthma, allergies, arthritis, cancer, and epilepsy. These conditions usually responded very well to fasting. For example, putting a patient with epilepsy on a water only fast for two to three weeks dramatically reduced seizure activity and severity with results lasting years. Doctors noted that the longer they could keep a patient on a fast the better the outcome. A normal weight person could safely fast, consuming nothing but water, for at least 6 weeks; overweight people could fast much longer. However, fasting generally did not last more than about 4 or 5 weeks. In an attempt to extend the period that patients could benefit from a fast, researchers developed a diet that would mimic the metabolic and therapeutic effects of fasting but allow enough food to maintain good health for an indefinite period of time. This was called the ketogenic diet. The ketogenic diet allowed patients to gain all of the health benefits of fasting while consuming enough food to satisfy hunger and maintain good health for an extended period of time. The ketogenic diet was developed specifically to treat epilepsy and proved highly successful, bringing about complete lifelong cures to a large number of patients—a remarkable feat for an otherwise incurable disease. Over time, researchers began to wonder if the ketogenic diet could also be useful for other neurological disorders, so they tried it on patients with Alzheimer’s disease, Parkinson’s disease, multiple sclerosis (MS), ALS, traumatic brain injury, and stroke. In every case the ketogenic diet proved highly effective. It was later discovered that the ketogenic diet was also beneficial in treating a wide variety of health problems including obesity, diabetes, heart disease, cancer, allergies, arthritis, digestive problems, and essentially all the diseases that fasting had been used for. After all, the diet was designed specifically to mimic the metabolic effects of fasting so it only makes sense that it would have many of the same therapeutic effects as well. 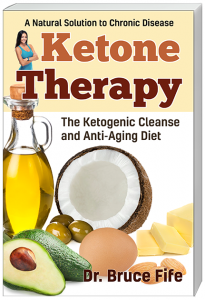 The ketogenic diet is defined as a very-low carb, high-fat, moderate- to low-protein diet. Normally glucose serves as the primary fuel for all the cells in our body. We get glucose primarily from the carbohydrates in our diet. When we don’t eat for a period of time or if we don’t eat any carbohydrate-rich foods, our blood glucose level drops. Our cells, however, need a constant source of fuel 24 hours a day. So when blood glucose levels decline, our cells need another source of energy. That source comes from stored body fat. Our fat reserves are broken down and fatty acids are released. Our cells use fatty acids just as they do glucose to produce energy. Some of these fatty acids are converted into an alternative fuel called ketones or ketone bodies. When we are burning mostly fatty acids and ketones in place of glucose, we are said to be in a state of ketosis. Ketones can be remarkably therapeutic and produce much of the beneficial effects of fasting. When our ancestors went without food or only had access to a little food, they naturally went into a state of ketosis. They were cycling in and out of ketosis constantly throughout the year and throughout their lives. This keto cycling, combined with a healthy traditional diet, protected them from chronic, degenerative disease. Of course, if the periods of fasting or severe food depravation lasted for too long it could lead to starvation, but as long as the periods of fasting were limited to just a few days to a few weeks at a time and were separated by periods of abundance, the people thrived and were healthy. One of the primary benefits of fasting is autophagy—the cannibalization of body tissues for recycling. When fasting, blood glucose declines which triggers the body to cannibalize fat stores to supply the energy it needs. Most of the cells in our bodies do just fine using fatty acids and ketones as fuel, however, some cells absolutely require glucose. If you are fasting and not eating any sources of glucose, where does the glucose come from to feed these cells? It comes from body proteins. Protein is broken down and converted into glucose. Where does this protein come from? Our bodies have a keen sense of self preservation, so vital organs like your heart, liver, and kidneys are not touched. The first source of protein the body cannibalizes are those that are of the least importance to your survival; this would include all old, warn out or dysfunctional cells and abnormal growths. The body essentially goes into housecleaning mode and cleans out fat and all of the cells and tissues that serve no useful function. It is only when fasting begins to approach starvation that the body starts to dismantle more essential tissues like functional cells in our muscles and organs. Our immune system is vitally important to our overall health. It is the immune system that protects us from disease-causing microorganisms, environmental and biological toxins, and from abnormal growths such as cancer. A malfunctioning immune system can lead to a host of health problems. Fasting can have a remarkable effect on immune health. There is some remarkable research being done right now in this area that is producing astounding results. Most people would assume that during a fast, when we are depriving ourselves of food and nourishment, that we would become weak and be vulnerable to disease. However, just the opposite happens, we become stronger and more resistant to disease. 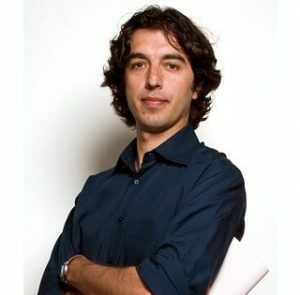 Valter Longo, PhD and his team at USC have been researching the effects of fasting on the immune system. He conducted a study using mice, splitting them into two groups. The first group was put on a 48 hour fast. The second group served as the control and received their normal scientifically designed, vitamin fortified chow supplying them will all the nutrients they need to maintain optimal health. The mice in both groups were then injected with a lethal dose of poison. The poison they chose to use was a chemotherapy drug, injecting the mice with an amount equivalent to about four times what a human cancer patient would receive. The mice receiving the nutritious diet immediately became deathly ill and lethargic; 65 percent of them died within a couple of days. The mice that were fasting, however, were running around as they normally do as if nothing happened. None of them died. The results were so shocking that Longo thought they may have done something wrong, so they repeated the experiment but ended up with the same outcome. Longo observed that during a fast white blood cell numbers decline but as soon as refeeding begins the white blood cell count quickly returns to normal. He looked into what was happening and discovered it was due to autophagy. When fasting, the body removes all the old, worn out white blood cells (to be converted into glucose) and when food is eaten new white blood cells are produced to take their place. After a period of fasting, when food is reintroduced, stem cells in the bone marrow are activated and produce new white blood cells. Old, dysfunctional white blood cells are replaced with new, functional white blood cells. In essence, fasting regenerated a more robust immune system. The treatment for cancer using chemotherapy is accompanied by many awful side effects including, hair loss, fatigue, weakness, nausea, diarrhea, mouth sores, memory loss, and numbness. One of the main problems with chemo is that it destroys the immune system. It kills the white blood cells and the bone marrow where white blood cells are formed, and has long lasting effects that make the patient vulnerable to infections and other health problems. Longo found that fasting immediately before and after undergoing chemotherapy maintains proper immune function and eliminates the side effects of chemo and even improves the effectiveness of the therapy. Fasting during chemotherapy has always been discouraged because it was believed to weaken the body and cancer patients are always encourage to eat more during chemotherapy. As Longo discovered, fasting doesn’t weaken the body, it makes it stronger and protects the immune system from the damaging effects of chemo. Since fasting can regenerate the immune system, it might be useful in treating people suffering from immune disorders, particularly those with autoimmune diseases such as multiple sclerosis (MS), type 1 diabetes, rheumatoid arthritis, celiac disease, Hashimoto’s thyroiditis, and lupus. Autoimmune diseases are believed to be caused by a dysfunctional immune system that attacks its own body. Longo decided to test the effects of fasting on MS—a common autoimmune disorder that affects the brain and spinal cord. With MS the immune system attacks the nerve cells destroying the protective myelin sheath that covers the nerve axon. His study consisted of two parts. The first part used three groups of mice that had the equivalent of MS. The first group of mice cycled in and out of a 3-day fast three times over a 30 day period. The second group was put on a mild ketogenic diet. The third group served as the control and ate a normal diet. At the end of 30 days the mice in both the fasting and ketogenic groups were showing significant improvement. Analysis of nerve tissue showed that the myelin covering on the nerves were being regenerated. The mice in these two groups, and especially the fasting group, had improved so much that 20 percent of them had completely recovered from MS—quite a remarkable feat since there is no medical cure for it. The second part of the study involved humans with MS. The subjects were separated into three groups. The first group was put on a periodic fast separated by a high-fat Mediterranean type diet. The second group was put on a ketogenic diet and the third group ate a normal diet. After 6 months the first two groups of patients reported significant improvement in their MS symptoms. The third group showed no improvement. Again, the fasting and ketogenic diet groups proved beneficial. Longo then examined the effects of fasting on another autoimmune disorder, type 1 diabetes. In this form of diabetes the insulin producing beta cells in the pancreas are attacked and destroyed by the immune system, leading to the diabetes. Mice with type 1 diabetes were used in this study. One group of mice was put on a four-day fasting cycle. Another group received their normal diet. The fasting mice had their immune systems regenerated. Old, dysfunctional white blood cells that had attacked the pancreas were replaced by new, healthy white blood cells. In addition, the damaged pancreatic beta cells were removed (recycled) and replaced with new, functional cells that produced insulin. These mice were now producing insulin with greatly improved blood sugar control. Again, Longo succeeded in reversing what was considered an irreversible condition. In his studies, Longo didn’t use a water fast but used what he calls a fasting mimicking diet—a diet that allows a limited amount of calories but mimics the metabolic and therapeutic effects of fasting. His fasting mimicking diet is a low-carb, low-protein, low-calorie, high-fat diet. Total calories are limited to about 800 per day. What does that sound like? It is basically a low-calorie ketogenic diet. Longo’s fasting mimicking diet is safe and easier than water fasting since it allows a limited amount of food. For those people who want to take advantage of the health benefits offered by his fasting mimicking diet, Longo recommends eating 800 calories or less for 5 consecutive days, once each month. It must be emphasized that in order for this diet to have the greatest therapeutic effect both carbohydrate and protein must be restricted. Carbohydrate must be limited in order to shift the body into ketosis. Protein must be restricted to activate the cannibalization of worn out cells. Most of the calories in the fasting mimicking diet come from fat. Although eating just steak and eggs is low-carb, and if you limit calories, it can be ketogenic, but it will not provide the therapeutic effects described by Longo. Since the ketogenic diet emphasizes limiting total carbohydrate intake, some people mistakenly think of it as a high-protein diet. That is false, it is a high-fat diet. If you eat too much protein, the excess protein will just be converted into glucose and may even prevent you from getting into ketosis. That is why the ketogenic diet is defined as one with moderate- to low-protein intake. If you want to go a step further and stimulate autophagy to clean out old, dysfunctional cells and revive your immune system, you need to eat a low-protein ketogenic diet. When people go on diets to improve their health and generally lose excess weight, they stay on the diet for a period of time and once they reach their goal weight (or tire of the diet), they go right back to eating the same foods that made them sick and fat in the first place. In time, the weight comes right back. They accomplish nothing. In order to make a permanent change in your health, the diet chosen must be part of a lifestyle change. The diet must be one that could be maintained for life. Most low-fat, weight loss diets are not suitable for a lifetime because they are too restrictive, unsatisfying, unpalatable, and often unhealthy. Many people will try a ketogenic diet for a few weeks or months and then, like any weight loss diet, go back to eating the poor quality foods they were eating before. In order to make the ketogenic diet powerful enough to achieve optimal health, the diet must be a part of a lifestyle change. A proper (traditional foods-based) ketogenic diet is nutritionally sound and can be adopted and maintained for life. However, this isn’t the best way to incorporate the ketogenic diet into a lifestyle change. 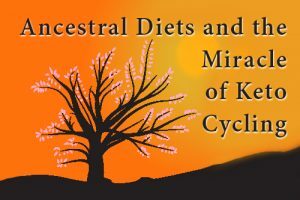 The best way is to mimic our ancestors and cycle in and out of ketosis just as they naturally did depending on food availability. Cycling in and out of ketosis has many advantages over staying in ketosis continually. One of the main advantages is that you do not have to permanently give up all the higher carb foods you love and can’t live without. You simply refrain from eating them for the periods of time you are actively in ketosis. This way you don’t feel deprived and temptation is not as intense. When you stay in ketosis for an extended period of time, your body begins to adapt to the elevated level of ketones and the therapeutic effects begin to decline. However, if you cycle in and out of ketosis your body does not have a chance to adapt and ketones maintain full therapeutic power regardless of how often you go into ketosis. Also, long-term ketosis makes you more sensitive to the effects of sugar and starch. This is why the rates of diabetes were so high in traditional meat eating cultures, such as the Eskimos and the American Plains Indians, when they were fed high-carb processed foods. Their bodies could not adapt to the increased load of carbohydrate in their systems. You can get into ketosis by eating full meals that completely satisfy your hunger, but restricting your total calorie intake for a time will also improve the effects of ketosis as demonstrated by Dr. Longo’s research. Optimally, the ketogenic diet should include periods of semi-fasting, much like his fasting mimicking diet. His 5-day fast has proven highly effective. When you are in ketosis, hunger is naturally suppressed and shifting into a reduced calorie phase for a few days is relatively painless. So, not only should you cycle in and out of the ketogenic diet, but for some of that time you should also cycle in and out of a reduced-calorie ketogenic diet. For example, you can go on a ketogenic diet for two weeks and for the last five days of the diet go into a reduced calorie ketogenic phase. You can repeat this cycle every month or two. Of course, you could maintain the ketogenic diet for a month or longer, the length of time you are in and out of ketosis is up to you. Keto cycling makes it possible for you to maintain the ketogenic lifestyle indefinitely. When you cycle out of ketosis your diet should be a healthy one—an ancestral diet, low-carb diet, or something similar. You definitely do not want to go back to feasting on sweets and junk foods. Often, when people adapt a ketogenic diet they feel deprived because they cannot have some of their favorite foods or enjoy a dessert on special occasions. With keto cycling this is no longer a problem. If you know that you will be in ketosis for only a limited period of time you can refrain from eating favorite foods temporally without feeling deprived. When you come out of ketosis you know you will be able to enjoy these foods again. When I talk about favorite foods, let me stress I am not talking about candy and junk foods but healthy foods that may contain too much carbohydrate for a ketogenic diet, such as starchy vegetables and fruits. When you cycle in and out of ketosis you can plan when you want to be eating a ketogenic diet, a calorie restricted ketogenic diet, or your normal healthy diet. This way you can plan to be out of ketosis when you know you will not be able to stay in ketosis easily, such as during the holidays like Thanksgiving and Christmas or your birthday when you want to a slice of birthday cake. Keto cycling makes the ketogenic diet much for effective and much easier to follow. It allows the ketogenic diet to be part of your lifestyle change. 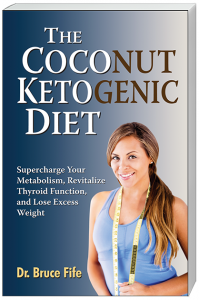 If you are new to the ketogenic diet and would like to learn the proper basics of the diet, I recommend reading my book The Coconut Ketogenic Diet. If you would like a more in-depth discussion of the diet with an emphasis on its therapeutic aspects, I recommend my book Ketone Therapy. Available from Piccadilly Books, Ltd.